Scentless Chamomile (Tripleurospermum perforatum (=T. inodorum)) is a dicot weed in the Asteraceae family. In Denmark this weed first evolved resistance to Group B/2 herbicides in 2010 and infests Spring Barley, and Winter wheat. Group B/2 herbicides are known as ALS inhibitors (Inhibition of acetolactate synthase ALS (acetohydroxyacid synthase AHAS)). Research has shown that these particular biotypes are resistant to florasulam, iodosulfuron-methyl-sodium, and tribenuron-methyl and they may be cross-resistant to other Group B/2 herbicides. 20 verified cases. Most of these cases are seed samples sent by farmers or consultants on suspicion of resistance. They have been tested in pot experiments including a susceptible and resistant reference population. Tribenuron-methyl and florasulam have been applied in 4-6 doses. A survey on untreated plots in agricultural fields all over Denmark showed that T. inodorum was resistant in 1% of the fields. 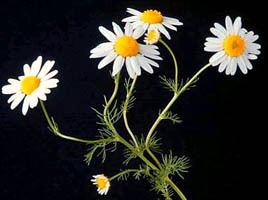 Greenhouse trials comparing a known susceptible Scentless Chamomile biotype with this Scentless Chamomile biotype have been used to confirm resistance. For further information on the tests conducted please contact the local weed scientists that provided this information. There is no record of differences in fitness or competitiveness of these resistant biotypes when compared to that of normal susceptible biotypes. If you have any information pertaining to the fitness of Group B/2 resistant Scentless Chamomile from Denmark please update the database. Deveikyte, I. ; Auskalnis, A. ; Seibutis, V.. 2007. An application of the herbicide mixtures in sugar beet and spring barley plants as a protective element preventing appearance of weed resistance. Progress in Plant Protection 47 : 350 - 357. Until recently, 261 biotypes belonging to 157 species (95 dicots and 62 monocots) and showing resistance to various herbicides are known. Herbicide resistance is known in all areas where herbicides are used intensively. Resistance of weeds to herbicides have been identified in 21 European countries. In Lithuania, herbicide resistance has not been proved in weeds. In agriculture practice, the most efficient to herbicide methods limiting herbicide resistant weed occurrence are rational agrotechnique, crop and herbicide rotation and application of herbicide mixtures. In 2002-04, studies on annual weed sensitivity and tolerance to phenoxy-carboxylic acid, phenyl-carbamates, benzofuranes and triazinones compounds were performed. Phenmedipham, desmedipham, ethofumesate was more effective for controlling Chenopodium album, Lamium purpureum, Polygonum aviculare and Tripleurospermum perforatum [Matricaria perforata] by applying in mixture with metamitron than by applying in mixture with chloridazon and chloridazon+quinmerac. The most effective were the mixtures consisting of 5 and 6 different active ingredients, e.g. phenmedipham+desmedipham+ethofumesate+metamitron+chloridazon and phenmedipham+desmedipham+ethofumesate+metamitron+chloridazon+quinmerac. C. album and Thlaspi arvense were very sensitive to herbicides MCPA, mecoprop+MCPA+dichlorprop and 2.4-D amino acid. G. aparine and Tripleurospermum perforatum were tolerant to MCPA. 2.4-D amino acid was ineffective on number and mass of G. aparine and L. purpureum. Mecoprop+MCPA+dichlorprop-P mixture was the best for weed control in spring barley..
Kay, Q. O. N.. 1994. Tripleurospermum inodorum (L.) Schultz Bip. (Matricaria inodora L., Matricaria maritima auct. p.p. non L., Matricaria perforata Mérat, Tripleurospermum perforatum (Mérat) Wagenitz, Tripleurospermum maritimum (L.) Schultz Bip. p.p. non L.). Journal of Ecology (Oxford) 82 : 681 - 697. A study of Tripleurospermum inodorum [Matricaria perforata] in the UK is presented. The following subjects are investigated: geographical and altitudinal distribution, habitat (climatic and topographical limitations and substratum), communities, response to biotic factors, response to environment (gregariousness, performance and effects of frost and drought), structure and physiology (morphology, mycorrhiza, perennation, chromosomes, photoperiodic response, resistance to 2,4-D, MCPA and other phenoxyacetic acid herbicides, and biochemical data), phenology, floral and seed characters (floral biology, hybrids, seed production and dispersal, seed viability and seedling morphology), herbivory and disease (animal feeders and parasites), and the history of the plant species. A map of the distribution of T. inodorum in the British Isles, a table of the occurrence of T. inodorum and associated species at 14 sites in Britain, and diagrams of a T. inodorum achene, germination stages and seedlings, are presented..